Beside Server Hardware, also double check if your IO Devices (eg. NIC, HBA,..) are supported when updating ESXi hosts from VMware vSphere 6.5 to 6.7. The following devices were supported in vSphere 6.5 but are according to VMware's HCL not (yet) supported in vSphere 6.7. Not supported does not say that it does not work. The list has been created with the help of my IO-Devices HCL in JSON Format. Did I miss something? Please comment. VMware has released a critical patch for vSAN 6.0 and 6.5. This patch contains a fix for a highly critical vSAN issue that might cause IO read errors and in some cases severe symptoms such as inaccessible VMs, host failures, or stuck resyncs. The issue manifests itself only under highly specific operations and IO patterns. The bug only affects All-Flash vSAN configurations with deduplication enabled. "vSAN detected an unrecoverable medium or checksum error for component uuid on disk group uuid." "vSAN detected and fixed a medium or checksum error for component uuid on disk group uuid." The following versions are affected according to KB2151042 and KB2151081. VCSA 6.5 Broken Filesystem - "Welcome to Emergency Mode"
Welcome to emergency mode! After logging in, type "journalctl -xb" to view system logs, "systemctl reboot" to reboot, "systemctl default" or ^D to try again to boot into default mode. Typically, this problem is caused by filesystem issues. This article explains how to fix the filesystem and get the appliance back up. If you want to get notified about new products, subscribe to my vTracker RSS Feed. Today VMware has made the bits for vSAN 6.6 available for everyone to download. Unicast - In vSAN 6.6, cluster communication has been redesigned to use unicast traffic. Multicast is no longer required on the physical switches to support the vSAN cluster. 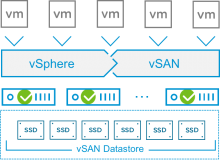 Encryption - vSAN supports data-at-rest encryption of the vSAN datastore. When encryption is enabled, vSAN performs a rolling reformat of every disk group in the cluster. Enhanced Stretched Clusters with Local Failure Protection - Previously, vSAN's was able to provide a fully active-active, stretched cluster. vSAN 6.6 takes this a step further, allowing for storage redundancy within a site AND across sites at the same time. Site Affinity for Stretched Clusters - A new feature for vSAN 6.6 Stretched Clusters is the ability to configure site affinity. Configuration Assist and Updates - New Configuration Assist and Updates pages allows to check the configuration of your vSAN cluster, and resolve any issues. Resynchronization throttling - IOPS used for cluster resynchronization can be throttled to prevent performance bottlenecks. vSAN Health Command Line Tool - A new esxcli command allows to check vSAN health from the command line (esxcli vsan health). Degraded Device Handling - vSAN 6.6 provides a more proactively stable environment with the detection of degraded and failing devices. Beside Server Hardware, also double check if your IO Devices (eg. 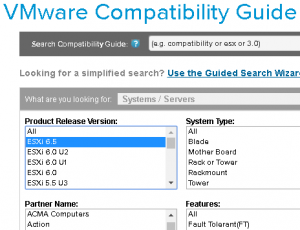 NIC, HBA,..) are supported when updating ESXi hosts from VMware vSphere 6.0 to 6.5. The following devices were supported in vSphere 6.0 but are according to VMwares HCL not (yet) supported in vSphere 6.5. When running vSphere 6.5 deployments in default (recommended) mode, VMware Certificate Authority is its own root certificate authority. Everything fine and secure with this configuration, but your browser displays a warning because the root certificate is not trusted. I made a little script (VBS) that pulls the CA certificate from a vCenter Server or Platform Services Controller and adds it to the local trusted root certificates store. When the root CA is trusted, browser warnings are gone. In vSphere 6.5 the smallest supported memory configuration for the vCenter Server Appliance has been raised from 8GB to 10GB. The smallest "Tiny" deployment size allows up to 10 ESXi Hosts and 100 Virtual Machines. Resources in Homelabs are limited and you might want to lower the memory consumption of the vCenter Servcer Appliance. This article explains how to lower the resource consumption to be able to lower the memory to about 6GB without noticable impacts.